via the always amazing Finders Keepers Records: Never one to merely scrape the surface of a niche genre, the Finders Keepers bloodhound digs deeper still into the core of the Indian subcontinent exhuming a concise party pack of opulent, off-centre Pakistani party targets driven by the pounding drum box rhythms of some of Lollywood pop’s most notorious studio scientists. 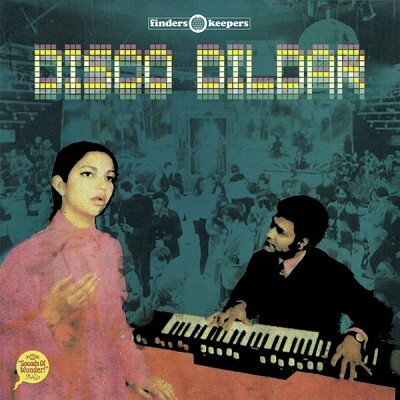 ‘Disco Dildar’ features rare plugged-in proxy pop from some of the country’s lesser-known teen flicks spanning the late 1970s and 80s, featuring drum heavy disco guesstimates built around multilingual lyrics celebrating Saturday nights, Disco Dildars and Hindustani Hogmanays. These original synth-dripped 45 EPs are not from the front of the pile, nor the quirky result of some token musical tourism. The music found here once soundtracked rebellious all-nighters and hotel bar rendezvous from films of which your parents might have not approved hence their scarce obtainability. Again the Sounds Of Wonder team who bought you ‘Thai Dai’, ‘Life Is Dance’, ‘Ilectro’, ‘Bollywood Bloodbath’ and others share equal doses of the excitement, wonderment and bewilderment that comes when first needle-dropping these elusive gems. • Featuring the cut and paste, electronics and fuzz tones of flightless super heroes such as Tafo, Ashraf, Rana and Ahmed, whilst voiced by Mehnaz, Runa Laila and Queen Noor Jehan, it is plain to hear why the work of these DIY cosmic composers have eclipsed the collectable desirability of filmic fruits igniting dance floors and providing sample fodder of the wider continent for Wu-Tangular producers in their stride. • This workshop funk redefines both DIY and disco revealing a whole new side to world music and marks Pakistani pop culture’s transformation from disposable and indefinable to indispensable. Support/Invest in TEMU's creation of his upcoming "Relic of the Mothership EP"